Authors: SOLOPOVA O.A., CHUDINOV A.P. The framework for the present research is diachronic political metaphor studies that deal with the historical development and historiographical potential of political metaphors. The relevance of diachronic analysis of political metaphors in British political discourse (1945-2000) is determined by both linguistic and extralinguistic factors. The paper analyzes the evolution of conceptual images associated with World War II. The study utilizes the principle of uniform fragmentation with a 5-year fragmentation step (9 May 1945; 9 May 1950; 9 May 1955 ... 9 May, 2000) interconnected with the principle of focus fragmentation. A digitized sample from the British Newspaper Archive corpus is investigated through corpus analysis, cognitive and discourse analysis and metaphorical modeling. The statistical outcomes demonstrate that the frequency of references to “Russia’s V-Day” in the issues dated by 9 May in each fragmentation step correlates with the general decrease of interest in Russia. The conceptual analysis shows that the military-political discourse is mythologized and tends to present the image of the world as a black-and-white value model. The paper evaluates the pragmatic potential of the dominant metaphorical models, elicits the discursive factors that shape the usage and meanings of metaphors, demonstrates the interdependence between metaphors and the images they generate and emphasizes the role of the historical context in this process. 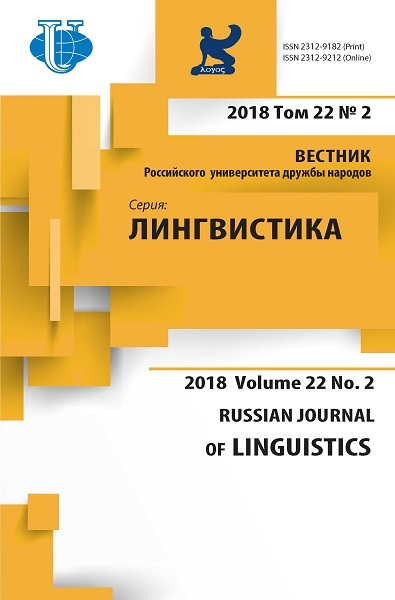 The results of the work are of interest to a wide range of Russian and foreign specialists in cognitive linguistics, political linguistics, political science, history, sociology. military-political discourse, diachronic metaphor studies, conceptual metaphor, World War II, Soviet Union, Russia, image of the enemy, image of the ally. Мальцев Г.И. Традиционные формулы русской народной необрядовой лирики (Исследование по эстетике устно-поэтического канона). Л.: Наука, 1989. 168 с. [Mal'tsev G.I. (1989). Traditsionnye formuly russkoi narodnoi neobryadovoi liriki (Issledovanie po estetike ustno-poeticheskogo kanona). Leningrad: «Nauka». (In Russ)]. Anikin, E.E., Budaev, E.V., Chudinov, A.P. (2015). Historical Dynamics of Metaphoric Systems in Russian Political Communication. Voprosy Kognitivnoy Lingvistiki, 3 (44), 26—32. Cameron, L.J. (1999). Identifying and describing metaphors in spoken discourse data. In L.J. Cameron, G. Low (eds.) Researching and Applying Metaphor. Cambridge: Cambridge University Press, 105—132. https://doi.org/10.1017/cbo9781139524704.009. Chilton, P.A., Lakoff, G. (1995). Foreign policy by metaphor. In Ch. Schaffner, A.Wenden (eds.) Language and Peace. Aldershot: Dartmouth, 37—59. https://doi.org/10.4324/9780203984994. Chilton, P. (2005). Manipulation, memes and metaphors: The case of Mein Kampf. In L. de Saussure, P. Schulz (eds.) Manipulation and Ideologies in the Twentieth Century. Amsterdam/Phila­delphia: John Benjamins, 5—45. https://doi.org/10.1075/dapsac.17.03chi. Chudinov, A.P., Solopova O.A. (2015). Linguistic Political Prognostics: Models and Scenarios of Future. Procedia — Social and Behavioral Sciences, 200, 412—417. https://doi.org/ 10.1016/j.sbspro.2015.08.088. Cowles, V. (1953). Winston Churchill; the Era and the Man. New York: Harper. https://doi.org/10.2307/2604710. Davies N. (2007). No Simple Victory: World War II in Europe, 1939—1945. New York: Viking. https://doi.org/10.3200/hist.37.2.49-52. Frank, R.M. (2009). Shifting Identities: Metaphors of Discourse Evolution. In A. Musolff, J. Zinken (eds.) Metaphor and Discourses. New York: Palgrave MacMillan, 173—189. https://doi.org/ 10.1057/9780230594647_11. Gibbs, R.W., Jr., Cameron, L.J. (2008). The Social-Cognitive Dynamics of Metaphor Performance. Cognitive Systems Research, 9 (1—2), 64—75. https://doi.org/10.1016/j.cogsys.2007.06.008. Harvey, A.D. (1999). The Body Politic: Anatomy of a Metaphor. Contemporary Review, 275 (1603), P. 23—45. Lakoff G., Johnson M. (1980). Metaphors We Live by. Chicago: University of Chicago Press. https://doi.org/10.7208/chicago/9780226470993.001.0001. Landtsheer, Ch. de. (1991). Function and the Language of Politics. A Linguistics Uses and Gratification Approach. Communication and Cognition, 24 (3/4), 299—342. Musolff, A. (2007). Which Role do Metaphors Play in Racial Prejudice? The Function of Antisemitic Imagery in Hitler’s “Mein Kampf”. Patterns of Prejudice, 41 (1), 21—44. https://doi.org/10.1080/00313220601118744. Solopova, O.A. (2014). Russia in Europe: Future in the Metaphorical Mirror of Past. Voprosy Kognitivnoy Lingvistiki, 3, 126—137. Solopova, O.A. (2017). Metaphor in Modeling the Future: the Best-Case Scenario (Based on Political Discourses of Russia, the USA and Great Britain, the 21st Century). Vestnik Tomskogo Gosu­darstvennogo Universiteta, Filologiya, 46, 55—70. https://doi.org/10.17223/19986645/46/5. Trim, R. (2011). Metaphor and the Historical Evolution of Conceptual Mapping. New York: Palgrave Macmillan. https://doi.org/10.1057/9780230337053_11. Vertessen, D., Landtsheer, Ch. de. (2008). A Metaphorical Election Style: Use of Metaphor at Election Time. In T. Carver & J. Pikalo (eds.) Political Language and Metaphor: Interpreting and Changing the World. London: Routledge, 271—285. Copyright (c) 2018 SOLOPOVA O.A., CHUDINOV A.P.